"Fort Collins" redirects here. For other uses, see Fort Collins (disambiguation). 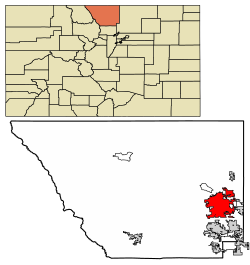 Location of Fort Collins in Larimer County, Colorado. 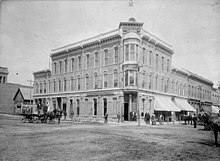 The 1880s saw the construction of a number of elegant homes and commercial buildings and the growth of a distinctive identity for Fort Collins. Stone quarrying, sugar-beet farming, and the slaughter of sheep were among the area's earliest industries. Beet tops, an industry supported by the college and its associated agricultural experiment station, proved to be an excellent and abundant food for local sheep, and by the early 1900s the area was being referred to as the "Lamb feeding capital of the world". In 1901 the Great Western sugar processing plant was built in the neighboring city of Loveland. Although the city was affected by the Great Depression and simultaneous drought, it nevertheless experienced slow and steady growth throughout the early part of the twentieth century. During the decade following World War II, the population doubled and an era of economic prosperity occurred. Old buildings were razed to make way for new, modern structures. Along with revitalization came many changes, including the closing of the Great Western sugar factory in 1955, and a new city charter, adopting a council-manager form of government in 1954. Similarly, Colorado State University's enrollment doubled during the 1960s, making it the city's primary economic force by the end of the century. Fort Collins gained a reputation as a very conservative city in the twentieth century, with a prohibition of alcoholic beverages, a contentious political issue in the town's early decades, being retained from the late 1890s until student activism helped bring it to an end in 1969. During that same period, civil rights activism and anti-war disturbances heightened tensions in the city, including the burning of several buildings on the CSU campus. Located along the Front Range of the Rocky Mountains, Fort Collins experiences a semi-arid climate (Köppen BSk), with four distinct seasons and low annual precipitation. Summers range from mild to hot, with low humidity and afternoon thunderstorms that frequently threaten but only occasionally deliver rain. Winters range from mild to moderately cold. The city experiences lots of sunshine, with 300 days of sunshine per year and 19 days with 90° + weather. The average temperature in July, the warmest month, is 71 °F (22 °C). The average temperature in January, the coldest month, is 29 °F (−2 °C). Annual snowfall averages 59 inches (1.5 m), and can occur from early September through the end of May. Average precipitation overall is 15.9 inches (400 mm). Fort Collins is the fourth most populous city in Colorado and the 158th most populous city in the United States. The Census Bureau estimates that the city's population was 161,175 in 2015, the population of the Fort Collins-Loveland Metropolitan Statistical Area was 310,487 (151st most populous MSA), and the population of the Front Range Urban Corridor was 4,495,181. There were 45,882 households out of which 29.0% had children under the age of 18 living with them, 44.9% were married couples living together, 7.9% had a female householder with no husband present, and 43.8% were non-families. 26.0% of all households were made up of individuals and 5.9% had someone living alone who was 65 years of age or older. The average household size was 2.45 and the average family size was 3.01. In the city, the population was spread out with 21.5% under the age of 18, 22.1% from 18 to 24, 31.5% from 25 to 44, 17.0% from 45 to 64, and 7.9% who were 65 years of age or older. The median age was 28 years. For every 100 females, there were 100.9 males. For every 100 females age 18 and over, there were 99.7 males. The median income for a household in the city was $64,459, and the median income for a family was $110,332. Males had a median income of $60,856 versus $48,385 for females. The per capita income for the city was $32,133. About 5.5% of families and 14.0% of the population were below the poverty line, including 8.3% of those under age 18 and 5.8% of those age 65 or over. Fort Collins' economy has a mix of manufacturing and service-related businesses. Fort Collins manufacturing includes Woodward Governor, Anheuser-Busch, and Otterbox. Many high-tech companies have relocated to Fort Collins because of the resources of Colorado State University and its research facilities. Hewlett Packard, Intel, AMD, Avago, Beckman Coulter, National Semiconductor, LSI, Rubicon Water and Pelco all have offices in Fort Collins. Other industries include clean energy, bioscience, and agri-tech businesses. FortZED is a zero energy district encompassing the Downtown area of Fort Collins and the main campus of Colorado State University. The district's public-private partnerships employ smart grid and renewable energy technologies to manage the local use and supply of energy. FortZED relies upon energy demand management techniques to encourage use of energy at the most efficient times. Federal, state, and local funding are making the project a reality. The U.S. Department of Energy has contributed $6.3 million and the Colorado Department of Local Affairs has provided $778,000. Locally, private companies and foundations have committed nearly $8 million. Much of Fort Collins's culture is centered on the students of Colorado State University. The city provides school year residences for its large college-age population; there is a local music circuit which is influenced by its college town atmosphere and is home to a number of well known microbreweries. The Downtown Business Association hosts a number of small and large festivals each year in the historic Downtown district, including Bohemian Nights at NewWestFest in late summer, which features local cuisine, music, and businesses. The Fort Collins Lincoln Center is home to the Fort Collins Symphony Orchestra and regularly attracts national touring companies of Broadway plays. 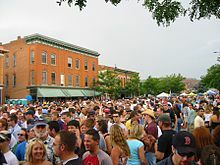 The Colorado Brewer's Festival is held in late June annually in Fort Collins. The festival features beers from as many as 45 brewers from the state of Colorado and averages around 30,000 attendees. New Belgium Brewery also hosts the Tour de Fat which draws over 20,000 people riding bikes and dressing in costume. As well as a series of Bike in movies starting late September. The Colorado Marathon is a yearly event running down the Poudre Canyon and finishing in downtown Fort Collins. The principal venue for the performing arts in Fort Collins is the Lincoln Center, 417 W. Magnolia St., at Meldrum Street. Built in 1978, the center includes the 1,180-seat Performance Hall and the 220-seat Magnolia Theatre, as well as four exhibit galleries and an outdoor sculpture and performance garden. It is home to many local arts groups, including the Fort Collins Symphony, Opera Fort Collins, Canyon Concert Ballet, Larimer Chorale, Youth Orchestra of the Rockies, OpenStage Theatre and Company, Foothills Pops Band and the Fort Collins Children's Theatre. Concert, dance, children's, and travel film series are presented annually. The center is wheelchair-accessible and has an infrared sound system for the hearing-impaired. Ticket prices vary considerably, but children's programs are often free or less than $10, and big-name acts and Broadway shows are $18 to $36. The center hosts nearly 1,750 events each year. The arts are represented by The Center for Fine Art Photography, University Center for the Arts, Fort Collins Museum of Art (FCMOA), the Arts Incubator of the Rockies (AIR), and the Bas Bleu Theatre Company. The Gardens on Spring Creek is an 18-acre (7.3 ha) botanical garden. The site includes several themed gardens ranging from a children's garden to a rock garden, to several themed demonstration gardens. There are also many parks in Fort Collins including community parks and neighborhood parks, totaling 875 acres (354 ha) of developed park areas. Some of these parks have facilities such as public tennis courts, frisbee golf courses, golf courses, dog parks, baseball diamonds, basketball courts and picnic shelters. In total, there are 6 community parks. These include City Park, Edora Park, Fossil Creek Park, Lee Martinez Park, Rolland Moore Park, and Spring Canyon Park. There are also many smaller neighborhood parks. These parks often host events such as marathons, community activities and holiday celebrations. Fort Collins has a council-manager form of government. The mayor, who serves a two-year term and stands for election in municipal elections held in April of odd-numbered years, presides over a seven-member City Council. The current mayor of Fort Collins is Wade Troxell, who was re-elected to a third term in April 2019. The six remaining council members are elected from districts for staggered four-year terms; odd-numbered districts are up for election in April 2017 and even-numbered districts in April 2019. Fort Collins is the largest city in Colorado's 2nd Congressional district, and is represented in Congress by Representative Jared Polis (Democrat). On the state level, the city lies in the 14th district of the Colorado Senate, represented by John Kefalas and is split between the 52nd and 53rd districts of the Colorado House of Representatives, represented by Joann Ginal and Jennifer Arndt, respectively. All three of Fort Collins' state legislators are Democrats. Fort Collins is additionally the county seat of Larimer County, and houses county offices and courts. K–12 public education is provided through Poudre School District (PSD). The district operates and manages the public schools in the city of Fort Collins, as well as in the surrounding towns of Wellington, Timnath, Windsor, Laporte and Livermore. The district is one of the fastest growing in Northern Colorado, adding 500 students — about the size of an elementary school — each year. To accommodate growth, the district plans to build three new schools in the next few years. Poudre School District includes four comprehensive high schools that serve neighborhoods around Fort Collins, including Fort Collins High School, Rocky Mountain High School, Poudre High School, Fossil Ridge High School. The district also operates four alternative high schools: Centennial High School, Polaris School for Expeditionary Learning School, Poudre Community Academy and Poudre School District Global Academy, a dual in-person/online school. Additionally, four public charter schools are chartered through PSD, including Ridgeview Classical Schools, and Liberty Common High School, Mountain Sage Community School and Fort Collins Montessori School. The Poudre School District is also home to ten middle schools (Lesher Middle IB World School, Blevins Middle School, Boltz Middle School, Cache La Poudre Middle School, Kinard Core Knowledge Middle School], Lincoln IB World Middle School, Polaris Expeditionary Learning School, Preston Middle School, Webber Middle School, and Wellington Middle School) and 32 elementary schools. In addition to PSD schools, several state charter schools serve Fort Collins, including Academy of Arts and Knowledge and Colorado Early Colleges and Global Village Academy. Private schools include Heritage Christian Academy, Rivendell School, and St. Joseph's Catholic School. Colorado State University heads up the choices in higher education. Front Range Community College also maintains a campus in the city, and grants associate's degrees in arts, science, general studies, and applied science. The college offers 17 high school vocational programs and more than 90 continuing education classes. Additionally, the University of Phoenix and Regis University maintain satellite campuses there. The Fort Collins Public Library was established in 1900, the sixth public library in the state. The city received $12,500 from philanthropist Andrew Carnegie to build the library, with the condition that it would be maintained as a free public library. It was completed in 1904 at a total cost of approximately $15,000. The library formed a regional library district through a ballot measure in 2006. It has been renamed Poudre River Public Library District. The district operates three branches: the Old Town Library is located in downtown Fort Collins; the Harmony library is hosted at Front Range Community College; and the Council Tree Library, which opened in 2009, is at the Front Range Village Shopping Center. The library participates in cooperative projects with the local school district and Colorado State University. Fort Collins has a range of research institutes. Facilities are maintained by the Centers for Disease Control and Prevention's Division of Vector-Borne Diseases, the Center for Advanced Technology and the Colorado Water Resource Research Institute. Other facilities include the Cooperative Institute for Research in the Atmosphere, the Institute for Scientific Computing, the U.S. Forest Service Experimental Station, the National Center for Genetic Resources Preservation (NCGRP), and the U.S.D.A. Crops Research Laboratory. In 2009, the Fort Collins-Loveland metropolitan statistical area (MSA) ranked as the third highest in the United States for percentage of commuters who biked to work (5.6 percent). Allegiant Air offered regular passenger airplane service into the nearby Fort Collins / Loveland Airport, but the airline ended commercial flights to this airport. Elite Airways resumed commercial air service at the airport on August 27, 2015, providing non-stop flights to the Chicago Rockford International Airport in Illinois. Denver International Airport, which is 70 miles (110 km) to the south, is served by twenty three airlines. Fort Collins can be approached from Denver by car via Interstate 25 or by way of the RTD bus system and the FLEX regional bus line. The city's former general aviation airport, known as Fort Collins Downtown Airport (3V5), opened in 1966 and closed in 2006. Fort Collins's downtown streets form a grid with Interstate 25 running north and south on the east side of the city. Many of the streets are named after the town's founders. U.S. Highway 287 becomes College Avenue inside the city and is the busiest street; It runs north and south, effectively bisecting the city, and serving as the east–west meridian, while Mountain Avenue is the north-south. SH 14 runs concurrent with US 287 at the northern city limit to Jefferson Street, running southeast along Jefferson (later turning into Riverside Avenue), then turning east onto Mulberry Street where it goes east out of the city after an interchange with Interstate 25. Fort Collins also once had a municipally owned trolley service with three branches from the intersection of Mountain and College avenues. The trolley was begun in 1907 by the Denver and Interurban Railroad, who had the intention of connecting the Front Range of Colorado together. It was closed in 1951 after ceasing to be profitable. In 1983–84, a portion of the Mountain Avenue line and one of the original trolley cars, Car 21, were restored as a heritage trolley service, under the same name used by the original system, the Fort Collins Municipal Railway. This has been in operation since the end of 1984 on weekends and holidays in the spring and summer, as a tourist- and cultural/educational attraction small fee applies to ride. The MAX Bus Rapid Transit is a bus rapid transit that provides service on the Mason Corridor Transitway parallel to College Avenue from Downtown Fort Collins to a transit center just south of Harmony Road. The trip takes approximately 15 minutes from end to end with various stops between. The service began in May 2014. The Mason Corridor and the Mason Express are intended to be the center of future transit-oriented development. Taxi service is provided by Northern Colorado Yellow Cab. Pedicabs are also available from HopON LLC and Dream team Pedicabs. Bicycling is a popular and viable means of transportation in Fort Collins. There are more than 280 miles (450 km) of designated bikeways in Fort Collins, including on street designated bike lanes, and the Spring Creek and Poudre River Trails, both paved. There is also a dirt trail, the 5.8-mile (9.3 km) Foothills Trail, parallel to Horsetooth Reservoir from Dixon Reservoir north to Campeau Open Space and Michaud Lane. The Fort Collins Bicycle Library lends bicycles to visitors, students, and residents looking to explore the city of Fort Collins. There are self-guided tours from the "Bike the Sites" collection, including a Brewery Tour, Environmental Learning Tour, and the Historic Tour. The Bike Library is centrally located in the heart of downtown Fort Collins in Old Town Square. The City of Fort Collins also encourages use of alternative transportation, like cycling and using public transit, though FC Moves. 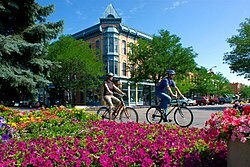 In 2013 the League of American Bicyclists designated Fort Collins as a Platinum-level Bicycle Friendly Community – one of four in the United States. In addition to cycling, the City of Fort Collins is preparing for the arrival of electric scooters. In early 2019, The City of Fort Collins and Colorado State University were preparing for their eventual arrival with regulations for electric scooters to avoid the problems other cities have with this. After a City Council session on Feb. 19, the City Government approved scooter regulations, like specific areas scooters must be parked in and stating that scooters must obey dismount zones. James B. Arthur, Pioneer, Entrepreneur, Mayor, Councilman, Colorado State Senator. Derek Vincent Smith, electronic music artist who performs under name "Pretty Lights"
Derek Theler, actor in ABC family show Baby Daddy. Fort Collins is known along with Marceline, Missouri as one of the towns that inspired the design of Main Street, U.S.A. inside the main entrance of the many "Disneyland"-style parks run by The Walt Disney Company around the world. In 2006, Money ranked Fort Collins as the best place to live in America. In 2011, Allstate Insurance listed Fort Collins as "America's Safest Driving City" in their annual "Best Drivers Report". In 2015, Fort Collins ranked No. 10 on Forbes' list of the Best Places for Business and Careers. In 2017, Fort Collins ranked No. 4 on Forbes' list of the 25 Happiest Cities in America. ^ "Colorado Municipal Incorporations". State of Colorado, Department of Personnel & Administration, Colorado State Archives. December 1, 2004. Archived from the original on November 23, 2010. Retrieved September 2, 2007. ^ "American FactFinder". United States Census Bureau. Retrieved November 6, 2014. ^ "Trends". City of Fort Collins. Retrieved June 21, 2016. ^ "Flooding Timeline in Fort Collins". Archived from the original on November 23, 2010. Retrieved September 28, 2007. ^ a b "Fort Collins Time Line 1860". Fort Collins Local History Archive. Archived from the original on July 10, 2011. Retrieved March 24, 2007. ^ "History of Colorado State University". Archived from the original on October 12, 2007. Retrieved May 12, 2007. 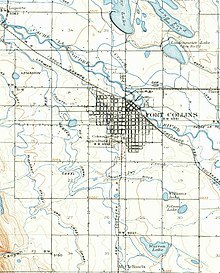 ^ "Fort Collins Time Line 1890". Fort Collins Local History Archive. Archived from the original on July 10, 2011. Retrieved March 24, 2007. ^ "Fort Collins Time Line 1900". Fort Collins Local History Archive. Archived from the original on July 10, 2011. Retrieved March 24, 2007. ^ "Fort Collins Time Line 1930". Fort Collins Local History Archive. Archived from the original on July 10, 2011. Retrieved March 24, 2007. ^ "Fort Collins Time Line 1940". Fort Collins Local History Archive. Archived from the original on July 10, 2011. Retrieved March 24, 2007. ^ "Fort Collins Time Line 1950". Fort Collins Local History Archive. Archived from the original on July 10, 2011. Retrieved March 24, 2007. ^ a b "Fort Collins Time Line 1960". Fort Collins Local History Archive. Archived from the original on July 10, 2011. Retrieved March 24, 2007. ^ "Fort Collins Time Line 1880". Fort Collins Local History Archive. Archived from the original on July 10, 2011. Retrieved March 24, 2007. ^ a b "Fort Collins Time Line 1970". Fort Collins Local History Archive. Archived from the original on July 10, 2011. Retrieved March 24, 2007. ^ "Fort Collins Time Line 1980". Fort Collins Local History Archive. Archived from the original on July 10, 2011. Retrieved March 24, 2007. ^ Grigg, Neil S.; Nolan J. Doesken; David M. Frick; Mike Grimm; 4 Marsha Hilmes; Thomas B. McKee; Kevin A. Oltjenbruns (September – October 1999). "Fort Collins Flood 1997: Comprehensive View of an Extreme Event" (PDF). Journal of Water Resources Planning and Management. American Society of Civil Engineers: 255–262. ISSN 1943-5452. Archived from the original (PDF) on March 15, 2013. Retrieved April 23, 2012. ^ "Fort Collins July 28, 1997". University Corporation for Atmospheric Research. Retrieved April 23, 2012. ^ "NowData – NOAA Online Weather Data". National Oceanic and Atmospheric Administration. Retrieved March 1, 2012. ^ "Fort Collins, Colorado CAFR 2017" (PDF). fcgov.com. Retrieved February 27, 2019. ^ "Home page for city council". City of Fort Collins. Archived from the original on November 23, 2010. Retrieved August 18, 2007. ^ Coltrain, Nick (April 2, 2019). "Wade Troxell wins third term as Fort Collins mayor in City Council election". Coloradan. Denver, Colorado. Retrieved April 3, 2019. ^ Kyle, Sarah (April 26, 2016). "PSD board approves plan to build schools". Fort Collins Coloradoan. Retrieved June 8, 2016. ^ Hansen, James E. (1977). Democracy's college in the Centennial State: a history of Colorado State University. Fort Collins: Colorado State University. pp. 230–231. ^ "Commuting in the United States: 2009" (PDF). American Community Survey Reports. September 2011. Retrieved December 26, 2017. ^ "Valley Airport / Fort Collins Airpark / Fort Collins Downtown Airport (3V5)". Abandoned & Little-Known Airfields. December 11, 2009. Archived from the original on November 23, 2010. ^ "Street Names Recall Early History: News Flashbacks: Fort Collins History Connection". history.fcgov.com. Retrieved February 24, 2019. ^ "Fort Collins Municipal Railway - History". www.fortcollinstrolley.org. Retrieved November 12, 2018. ^ Long, Raphael P. (April 1986). "Fort Collins Municipal Railway: Then and Now". Pacific RailNews, pp. 16–20. Glendale, CA: Interurban Press. ISSN 8750-8486. ^ "$87 million MAX project ready to roll in Fort Collins". May 9, 2014. ^ "New Platinum City in Latest Round of Bicycle Friendly Communities!". June 6, 2013. Archived from the original on June 29, 2013. ^ Trowbridge, Julia. "Fort Collins, CSU prepares for electric scooters". Rocky Mountain Collegian. ^ Ye, Samantha. "City Council approves scooter regulations". Rocky Mountain Collegian. ^ "NIST Radio Station WWVB". Retrieved March 18, 2014. ^ Corrinson, Michele (July 11, 2012). "Baby Daddy: Derek Theler Talks About His New Hit Show". College Magazine. ^ "Local History Archive Larimer Legends - Old Town & Disneyland - City of Fort Collins, Colorado". Library.ci.fort-collins.co.us. Archived from the original on March 31, 2014. Retrieved March 1, 2014. ^ "Best Places to Live 2006". Money Magazine. July 2006. Archived from the original on November 23, 2010. Retrieved December 15, 2006. ^ "Seventh Annual "Allstate America's Best Drivers Report" Reveals Safest Driving Cities". Allstate Insurance Company. September 1, 2011. Archived from the original on December 18, 2013. Retrieved January 2, 2014. ^ "Best Places For Business and Careers - Forbes". Forbes. Retrieved August 18, 2016. ^ Bloom, Laura Begley. "Ranked: The 25 Happiest Cities In America". Forbes. Retrieved November 2, 2017. Wikimedia Commons has media related to Fort Collins, Colorado. Wikivoyage has a travel guide for Fort Collins.